Apple’s iPod is putting the ‘fun’ in functionality and Japanese electronics makers are innovating for a piece of the action. 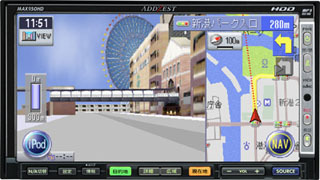 Car navigation system maker Clarion has added iPod access to their newest AddZest HDD series. Touch panels on the MAX950HD and MAX850HD will synch with the iPod via an optional connector cable. Like the iTunes PC display, the car version can bring up album covers and artist’ names on the screen. Drivers who prefer to burn music instead of rubber can use both the 950 and 850 to rip CDs at speeds of 4X to 7X. Something to do in those endless rush hour traffic jams. The built-in hard disk will hold around 4000 tunes. Full Specs from the company press release [in Japanese].Due out in mid-June, both units will play DVDs on their 7-inch screens, provide detailed road maps, alternative route mapping and serious non-musical road data. The voice navigational option can be switched from standard Japanese to Kansai style (Osaka has its own unique dialog) and English. Mapping, too, has options. Routes can highlight both major thoroughfares or alleys and back streets. Shortcut keys lock in various routes; gyro-sensors detail altitude and incline. An SD card slot lets drivers transfer data/music/images from other digital AV gadgets. Making those traffic waits more enjoyable starts at 275,100 yen ($2610) for the 950 model plus an additional 12,600 ($119) for the cable. The iPod: capable of streaming money as well as music for its parent company and partners.